Hot on the heels of my appointment as photographer to the American construction industry, I received a message the other day to say that another of my photos has been selected for publication, this time on an online tourist guide. 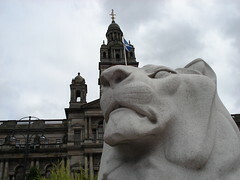 Schmap, who I’d never heard of before, have asked to use this photo of one of the lions in George Square in their new Glasgow Guide. Which was nice. It’s a clever concept, using (with permission) people’s photos in Flickr; and visitors to the guide can click through from images in the guide to the photographer’s own Flickr page. Because users of Schmap will be tourists, I thought I’d edit my photo‘s description in Flickr to give passing surfers some helpful background information about the statue. Tuesday 7 August 2007 in Uncategorized. Very funny & “informative” caption for the potential tourists who will visit your Flickr page. I have three Schmap inclusions, I think. One in Edinburgh for John Knox’s house on the Royal Mile, one in Glasgow for the People’s Palace, and one (pending) in Baltimore for some music hall I went to. I’ve never even heard of Schmap before, though, but it makes me think that next time I want to explore somewhere I should give it a look-over! I was contacted again this year for another Glasgow City Chambers interior shot I took. It’s always nice to hear people like your pics. Sounds like it’s not much of a rarity or honour to be in a Schmap guide, then. I’ve had one in their Cologne guide for a year, and there will be another in this year’s.